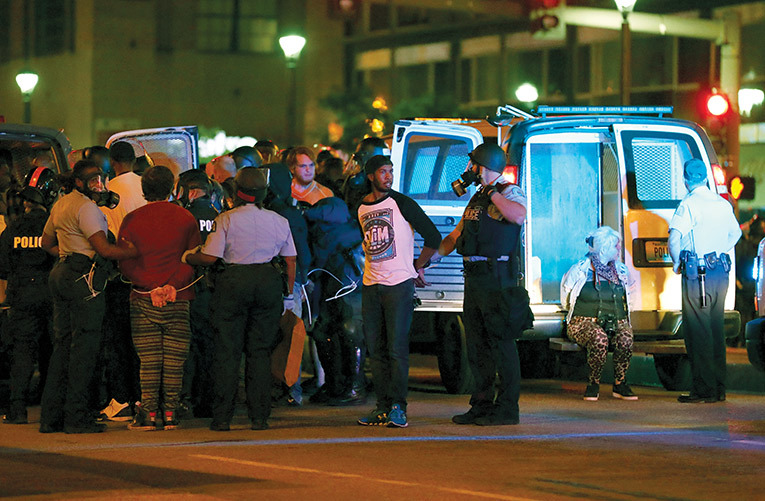 Protesters angry over the acquittal of ex-police officer Jason Stockley, a white cop on trial for murder in the shooting death of a black man, were back in the streets of downtown St. Louis early Monday after demonstrations the previous night turned violent. More than 80 people were arrested late Sunday as protesters attacked police, broke windows and flipped over trash cans, authorities said. On Monday, protesters were locking arms on Market Street, a few blocks from the site of the previous night’s violence. It was the fourth day of protests, which began Friday after Stockley was acquitted in the killing of 24-year-old Anthony Lamar Smith. Though the Stockley incident happened almost three years before Officer Darren Wilson killed Michael Brown in nearby Ferguson, Missouri, the unrest in Ferguson renewed interest in the case. Sunday night’s demonstrations began peacefully, but erupted in violence after nightfall, officials said. Amid the melees that ensued, some protesters broke concrete flower pots and used the broken pieces as projectiles. According to multiple reports, including that of St. Louis Post-Dispatch photographer Dave Carson, officers chanted, “Whose streets? Our streets!” after making arrests Sunday night along Tucker Boulevard. The Post-Dispatch is a CNN affiliate.